« I Blame the Lunch Ladies. When Your First is Your Last. 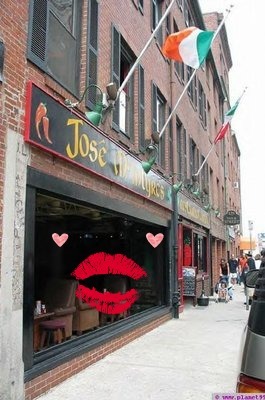 We were outside Jose McIntyre’s, a downtown bar that specialized in Guinness, vinegar-soaked fries and a sea of twenty-somethings reenacting nights formerly spent in fraternity bar rooms. We worked together. We’d been flirting for weeks. We’d danced that night (which makes it miraculous that he actually still liked me). I’d decided it was time for me to make the short walk home to my apartment in the North End. He offered to walk me home but I declined. Instead, he simply walked me out. And around the corner. And then he kissed me. I’ll never forget it. The man could kiss. Weak in the knees, I nearly invited him home. But, I didn’t. Two years later we got married. I don’t know what made me think of that night recently but, when I did, I was struck by how momentous that kiss actually was. Because you certainly never think about it when you’re 28 years old, living a young professional life, going out to bars and feeling like the world is absolutely positively YOUR oyster. You never think about the fact that, one day, along he’ll come. He’ll come and he’ll think you’re cute and you’ll like his smile. And, you’ll flirt and email and laugh. And then, one night, he’ll kiss you. That night? That night outside Jose McIntyre’s? It’s big. And, it’s funny to me that while you’re smitten and happy and feeling love-ish, it’s highly unlikely that at the time of your very first kiss you imagine you’d actually be marrying that person. Don’t get me wrong. I don’t ever want to kiss anyone else. God forbid something horrible happens someday and I’m forced into the hideous position of having to go through all that first dating, first kissing, first s-e-x crap again. ‘Cause however exciting and fun it all is at 28, it sounds absolutely HELLISH at 40. Either way, I love remembering that night outside Jose McIntyre’s. I love remembering that night as our first kiss. His smile. My weak knees. And, while I had no idea then, I couldn’t be happier to know now that his kiss will be also my last kiss. BTW, I read dig this chick 😉 Love her! Great story! Makes me think of my first love. We’ve been married for 39 years and each kiss is still so sweet. Thanks for sharing! Love this story! Perfect Valentine’s story! I don’t know if I remember our first kiss as vividly, but I do remember major kiss fests in the beginning. Just leaving a party or bar and hanging out against a wall going at it. aaahhh! Those were the days.